It happened. And by 'it' I obviously mean I found the perfect camel coat - you know the one I've been searching for my whole life (maybe a slight exaggeration but...). Okay, fine, I may have not been searching for a camel coat my whole life but I've definitely been on the search for one for at least a good 2 years (no exaggeration this time) because there has always been something wrong with the ones I've come across in the past - you know how it goes; wrong shape, wrong length, wrong material, wrong shade... You get the idea! So when I was browsing the new Zara autumn collection online a couple of weeks ago and saw this - I'm not going to lie - my heart started beating a little faster. I then saw it in the Covent Garden store but was in a rush at the time so didn't get to, umm, give it my full attention (haha). I then saw it again maybe a week later again in the Covent Garden store but this time I made sure to try it on, of course this only made me fall even deeper in love with it but I put it back telling myself I didn't need another coat. Then after adding it to my online basket about 10 more times, dreaming about it and telling myself I did in fact need a new coat I finally purchased it, and boy am I glad I did! I have a slight hunch that this is going to be my one outfit for autumn/winter that people will see me wearing and say "your seriously wearing that outfit again" to which I will reply "of course, you find the perfect camel coat and try not to wear it everyday". Honestly though, this was such an easy outfit to 'throw' on and because all the pieces are so minimalistic the outfit made me look like I tried way harder than I realistically did, haha. The photos were taken in my favourite part of London - South Kensington, just opposite the V&A. South Kensington/Knightsbridge is probably my favourite area in London because everything is just so photogenic and well, cute (aka a bloggers dream) !! Have you got a 'Camel coat'? How do you style yours? 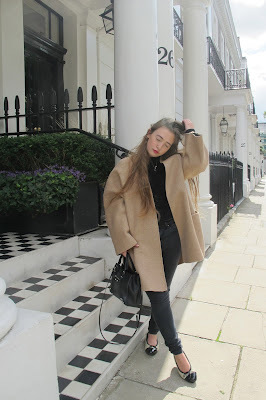 I can't wait to get my camel coat out again, I love styling it with all black like you have! I know I think the camel and black work so well together !! Definitely going to be one of my go-to outfits !! I'm so impressed with Zara's collection at the moment it's so lovey , they also have some other camel pieces so definitely have a look. Camel everything is my moto at the moment , haha!! But seriously it's just such a lovey colour for autumn.